In a large saucepan over very low heat, gently melt the chocolate. Stirring until smooth. Pour in sugar, cornstarch, cocoa powder, milk and salt, stir and raise heat to medium. A whisk may be needed to fully incorporate the sugar, chocolate and cocoa into the milk. Cook mixture, stirring frequently until it thickens, coating the back of a spoon*, anywhere between 10-15 minutes. Remove from heat, add vanilla and butter and stir until combined. Set aside to cool. slightly then pour into popsicle molds. (I used 5 oz Dixie Cups. The waxy interior provides for easy removal. Just cut or rip away the cup from the popsicle) The colder the mixture is when it goes into the freezer the quicker it will freeze. The shorter the freezer time, the smaller the ice crystals will be, which means it will have a more smooth creamy texture. I filled the Dixie cups up about half way. Freeze for 30 minutes, or until slightly set, and then insert popsicle sticks. Freeze the rest of the way before serving. They do melt fairly quickly, so once as they are removed from the freezer, be ready to enjoy! *Note: What does "Coating the back of a spoon" really mean? It's a way to test the thickness of a sauce. 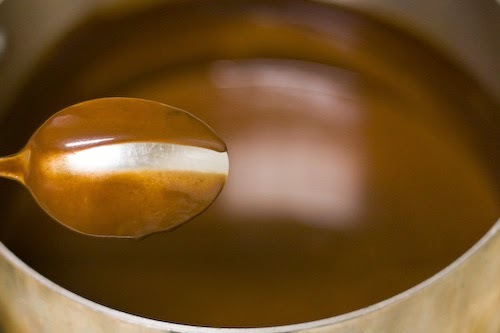 If it is thick enough to "coat the back of the spoon" when a spoon is dipped in the sauce and a streak is wiped away, the rest of the sauce will hold to the spoon. See picture below.